There's nothing like making a new writer friend. I met Talli online after she posted a review of my novel on Goodreads. I've since found out that she is a fellow Canadian ( who resides in London) and a talented writer. 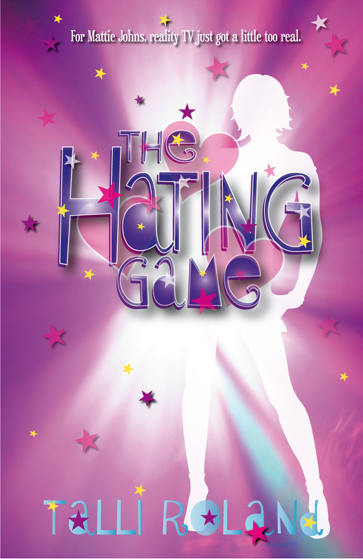 Her first novel, The Hating Game, recently hit the Kindle bestseller list at Amazon.com and Amazon.co.uk. The paperback edition will be out next March. career depends on stopping her from making it to the end? It sounds such fun, right? Talli is generously offering two copies of her e-book as a giveaway. To win, become a follower of my blog, simply drop by her lovely blog, and leave me a comment here about why you'd love to win her book. No Kindle? Download a free app at Amazon for Mac, iPhone, PC, Android and more! Thanks Talli! Winners will be announced next Tuesday. I love that your blog is pink! Heading over from Talli's blog. I just love the synopsis of your book, and am going to look for it at my nearest bookseller. I stopped by from my friend Talli's place. Pleasure to meet you. You have a beautiful blog w/ wonderful pictures! Oh, how I love Dior! I recommend Talli's book very highly! Gorgeous blog design, by the way. As a fellow pink blogger, I'm jealous! Popped over from Talli's to peruse your lovely blog. Will be adding your book to my ever growing list of to reads. Looking forward to it too. Oh and very nice to make you acquaintance. Thanks for the great idea on the book buzz, Isabelle! :) It's a pleasure to have your book on my blog, and vice versa! Hey, Isabelle! Found you from Talli's latest entry. I am quite a fan of Talli as a person and her blog, so I decided to check out her recommendation of your blog! Very bright and beautiful, now following! Hi Isabelle .. amazing coincidence - but what luck and swapping book giveaways .. and fellow Canadians .. surprise surprise ..
J'Adore sounds so interesting .. and Talli's The Hating Game definitely has a twist or two in it .. This book has been on my wish list. I hope I win it. I'm visiting from Talli's place (and an official follower now *waves*)! Talli's book is amazing! I cannot say enough great things about it! It should be on everyone's Christmas list for sure! As for your novel, it sounds amazing! Talli talked about it yesterday and I have to get my hands on it! So if I don't win I know what I'll be purchasing! I'm currently reading your book (and adoring it), so anything you have to recommend and give away, I'm sure I'll enjoy. Off to visit Talli's blog now. P.S. J'adore ton blog et la couleur rose. I'd like to win this book in order to give it to my friend from church, Katie. She's a bit younger, with two more children than me & I think she'd enjoy the escape!